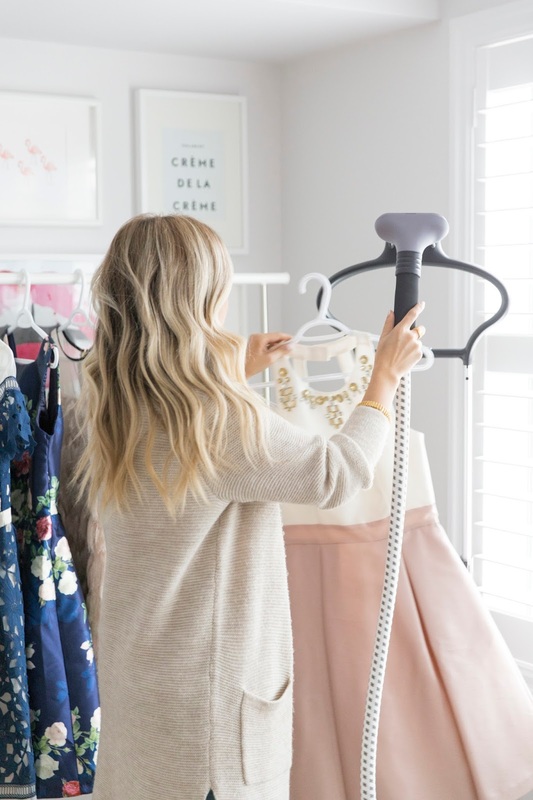 When your closet is overrun with feminine pieces such as silk blouses, party dresses, midi skirts and more - ensuring your #OOTD is not only on point but crease free - is a must. 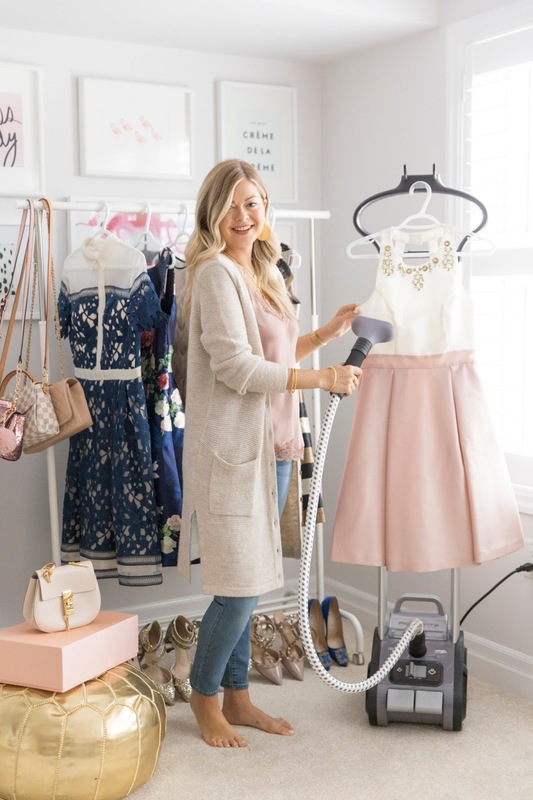 As much as I love luxe fabrics, that fold line across a new blouse or a skirt that’s been stuck in your closet for the past season and looks worse for wear can completely take away from that picture perfect look. 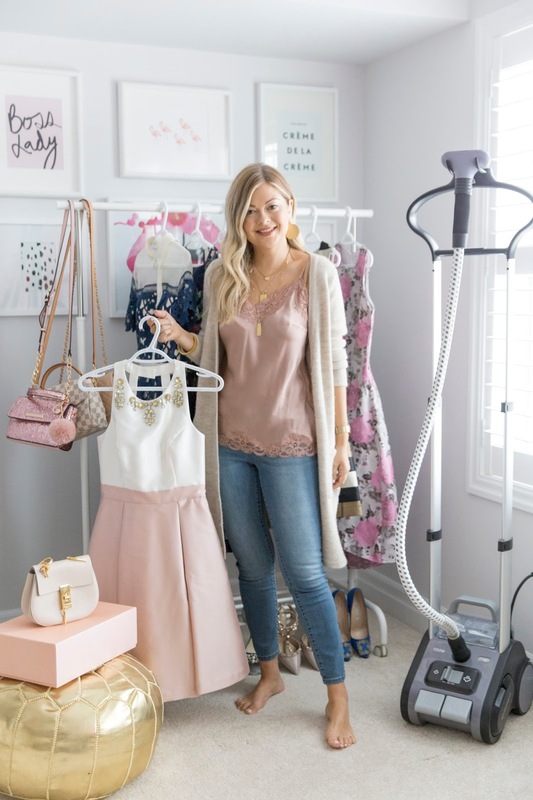 I’m actually embarrassed to admit that only up until a few months ago, I was using an iron to remove any last minute creases, fold lines and other imperfections in my wardrobe. As a girl who’s running late 99% of the time, that wait for the iron to heat up (let alone toggling between fabric temperatures) was excruciating. 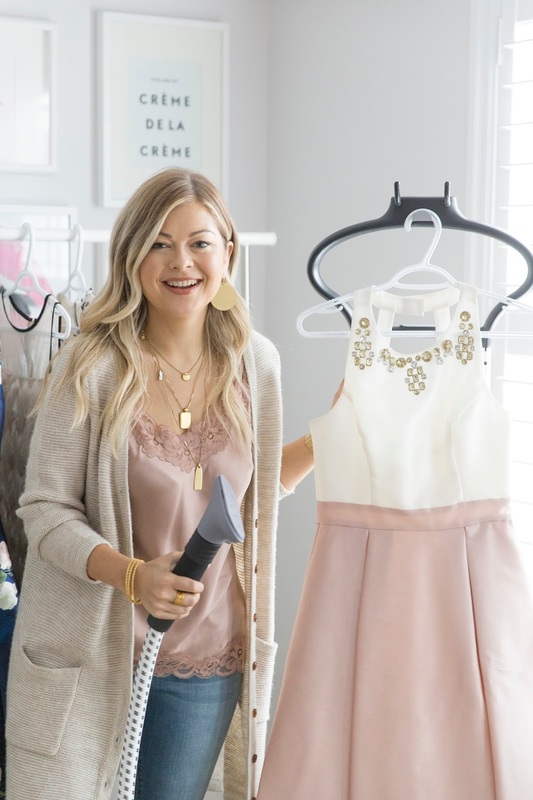 When Rowenta reached out to see if I would be interested in test-driving the Precision Valet steamer, I was definitely game. When scanning the features of the project, there was one, which immediately caught my eye: the water is heated and that steamer is ready to go within 60 seconds. In fact, I have to admit that I find it to be ready even sooner and is kick started with the simple tap on the foot pedal. I also love that the steamer has a large tank which holds 3.8L of water. 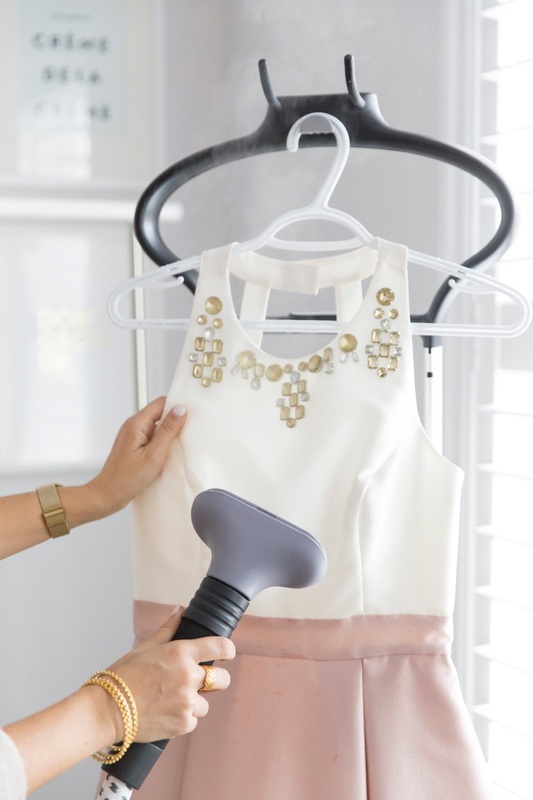 I’ve used hand held steamers in the past when travelling and while they do the job, it can feel like you’re topping up the device with water after completing 1 detailed blouse at best. Since it can hold so much water, you can steam for up to 1 hour without having to refill the tank. And for those easy distracted – like myself – there’s an automatic shut off feature, which offers peace of mind. 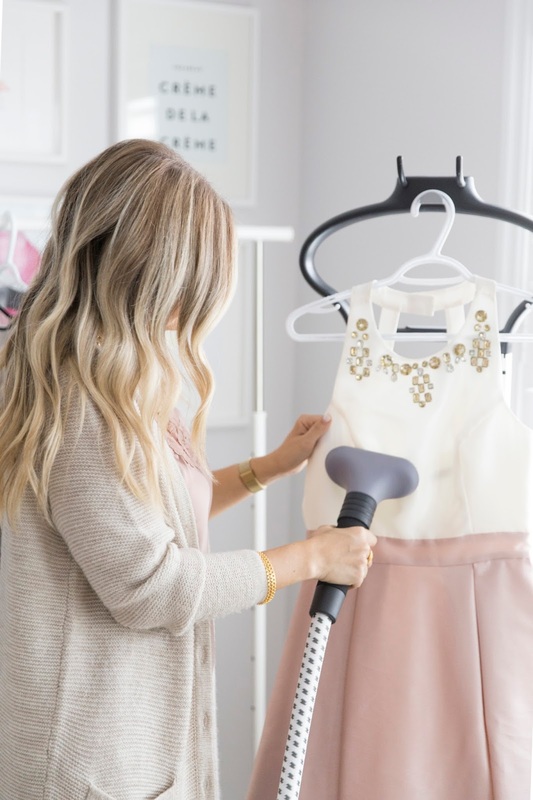 As mentioned above, I’ve tried some seriously horrendous tactics at ironing shirts in the past (holding it in mid air, hanging it off the edge of the ironing board and worse…) but the integrated hanger on the steamer allows you to hang blouses, dresses or pant clips so you can steam away and have both hands free. To say I’m a changed woman would be an understatement. Now I find myself steaming items that don’t even need any touch ups just for the fun of it! My only complaint after putting it to the test for 2 weeks? That I can’t pack it with me to Palm Beach next week! This post was sponsored by Rowenta Canada. All thoughts and opinions expressed are my own. 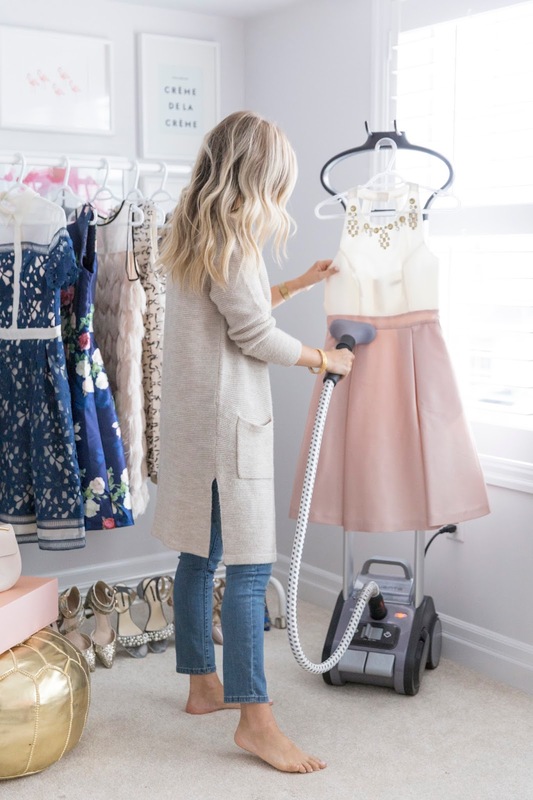 When I worked at a wedding shop, I became completely enthralled with steaming and I need one in my house. It's so relaxing and makes your clothes look amazing!